Adjacent to Paper Mart’s 200,000 sq. ft. facility, The Paper Mart Store retail location gives customers immediate access to the largest paper warehouse on the East Coast. Our warehouse is stocked with over 16,000 items including flat sheets, rolls, cut size sheets, invitations, announcements, envelopes and much more! At The Paper Mart Store we specialize in “cut size” sheets and broken carton quantities. Folio size sheets required for custom cutting are available for same business day pick-up or next business day delivery. In addition to the extensive paper inventory, our envelope assortment is the largest and most complete in the tri-state area. If you don’t see it on our shelves, Your Paper and Envelope SpecialistSM will help you find it! 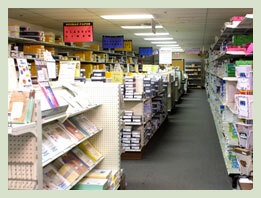 At The Paper Mart Store, We’re Paper Smart®! Delivery and pick-up services available – Contact Us to learn more.